Situated within the Galle Fort, the museum was first made public in 1992. The single storied museum is one amazing place to spend time and ideal for arts and crafts lovers. The museum contains a limited collection of objects belonging to periods of Portuguese, Dutch and British. The three galleries of the museum are “Cottage Industries Collection”, “Dutch Furniture and Weaponry Collection” and “Sri Lanka China Friendship Collection”. Some of the most interesting collection of the museum include, Beeralu lace, Turtle shell jewelry and traditional wooden mask carvings. The onshore lighthouse is also referred to as the “Pointe de Galle Light”. 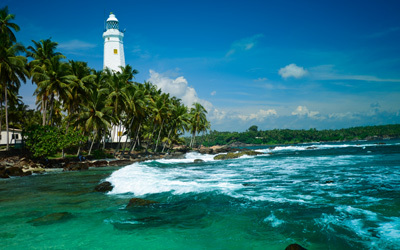 The lighthouse station which is a popular major tourist attraction is located within the Galle fort and is declared as a UNESCO world heritage site. The original light of the lighthouse was floating in a bath of mercury covered by a glass prism. The lighthouse is about 80 feet high and considered as the oldest light station on the Island. Formed in the 16th century, the old Galle city has many influences and modifications time to time. The urban ensemble of the city of Galle is an interaction of Europeans and South Asians during the periods of 16thto 19th centuries. It’s a proven fact that most European models concerning Sri Lanka’s climatic, historical, geological and cultural are being adapted to the development of the city. Utilization of granite in the construction process, widening of roads with grass and plants by sides, conforming measurements to regional metrology are a few examples of many. Visitors can enjoy a walk around the old city of Galle and gather fascinating experiences. Visit the incredible museum with a collection of folk arts. Masks belonging to 19th century of various communities and British officials are a unique collection to the museum. The museum is set in a huge yet beautiful garden with trees which mark the shade ways. The old house of the author is well preserved and transformed in to a museum with everything original being placed. The museum also includes a collection of old boats, carriages and carts which were transporting models at the time of author. One wouldn’t miss visiting “Madol Doowa” (Small Island), in close proximity which was author’s bestselling novel. The charming historic church from the time of 1755 is reported to be impressive to bits. The church is designed with features like none other. The stained glass windows with various colors, the white interior at the entrance blended with the Malaysian Calamine wood and the elegant wooden pews highlights ancient Dutch. The church which resembles historic and architecture possesses and old pipe organ, stained glass work and tombs in the church to your excitement. The mountain with historic beliefs of Buddhists and Hindus hold a major importance in tourism. The tourists can reach the Rummassalla mountain top and witness the Japanese pagoda on top of the mountain as well as a Buddhist temple and a Hanuman Statue. According to the Ramayanaya, Lord Hanuma in aid of his brother Lakshman, carried a mountain of herbs to heal him and thus the mountain is covered with plants not endemic to the region. Visiting Galle is an experience that arouse individual curiosity for its diverse attractions and ancient influences. Some other places of interests tourists can visit include, Luna Terrace, Meera Mosque and Jungle Beach. Feel free to take part in Yoga, snorkeling and Scuba diving anytime of the vacation.